Although categorized as lagomorphs, rabbits have something in common with rodents: Their teeth grow continuously throughout their lifespans. To counteract this growth, they must chew extensively to keep their teeth worn down. Regular dental examinations and a high fiber diet that encourages chewing will preserve your rabbit’s dental and overall health. A weekly inspection of your rabbit’s upper and lower front teeth, or incisors, is not difficult. You will notice if these teeth appear too long or begin to grow crooked. It is extremely difficult for owners to examine the cheek teeth, or premolars and molars. Until signs of advanced dental disease are noticed, you will not know if these teeth have begun to overgrow. Having a veterinarian perform a regular dental examination is important to avert the problems that can arise from overgrown teeth, including oral abscesses, tongue lacerations, oral ulcerations and deforming malocclusion caused by the rabbit’s misaligned bite. Regular examination ensures early detection of dental disease, enabling successful veterinary treatment. The most proactive measure you can take to care for your rabbit’s teeth and prevent overgrowth is to feed a diet that includes fibrous foods to chew on. While commercial rabbit pellets may contain the recommended daily nutrients for a rabbit, they are not formulated to require extensive chewing. 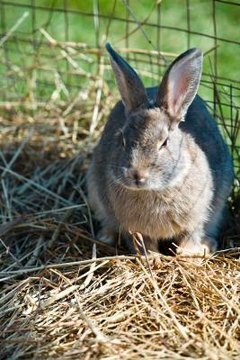 In addition to these pellets, offer your rabbit plenty of grass hay, such as timothy hay, and leafy greens, such as kale. As herbivores, rabbits enjoy these high fiber offerings, and the chewing that fiber requires is essential in maintaining your rabbit’s gastrointestinal health and in preventing tooth overgrowth. Provide some non-dietary items with which your rabbit can amuse himself while chewing on them. Some safe examples include blocks of wood that have not been painted, varnished or treated, natural wicker baskets or mats that have not been painted or glazed, and small log sections from trees that have not been treated with pesticides or herbicides. For an occasional indulgence, pet supply stores carry treat blocks and logs of treats that rabbits can gnaw apart and chew on. Appraise your rabbit’s teeth regularly. If you note a change in color, shape or size, bring your rabbit to his veterinarian for proper treatment. Other signs of dental problems include excessive salivation, changes in appetite, nasal discharge, tearing from the eyes or bulging around the eyes, food dropping from his mouth while eating and excessive tooth grinding. The veterinarian will perform a complete examination and treat the problematic teeth. Today, most veterinarians file down overgrown teeth with a dental burr attached to a motorized handheld instrument. Once he's been treated, your rabbit’s mouth will feel better and he will be able to delve into chewing and wearing his teeth happily once again.